Despite recent campaign flubs that have significantly challenged the inevitability of Sen. Hillary Clinton (D-NY) winning the Democrat nomination for president, the supposedly smartest woman in the world continues to go after prominent media members. After highly-publicized attacks on NBC's Tim Russert and David Gregory last year, Hillary has now set her sights on CNN's Lou Dobbs, referring to "commentators who are doing well for themselves by making [immigration] a hot issue," while asking "does all that hot air solve anything?" More presidential candidates are responding, beginning to respond to voter frustration over the issue of illegal immigration. They're presenting their own plans to fix our broken borders but not all of the presidential hopefuls are welcoming a debate about the tide of illegal aliens coming across our brooders. As Louise Schiavone reports now, Senator Hillary Clinton says my concerns on the issue of illegal immigration are just all that hot air as she put it. It's fascinating to see Senator Hillary Clinton and Senator Barack Obama otherwise intelligent and generally respectful people decide to take me on this issue. The motivation I can't imagine because both people in point of fact have modified their views considerably over time. I think that what both candidates will discover on this issue is that the left wing of the liberals in the Democratic Party in the primary process support illegal immigration just as the right wing of the conservative element of the Republican Party supports illegal immigration for entirely different reasons. By the way, the candidates that pander to both extremes, are, as far as I am concerned, abject fools. They will pay a price for it in the general election when they have to answer to the great center of the country. Louise, thank you very much; Louise Schiavone reporting from Washington. Senator Clinton, I'm just so hurt. We can talk about that later. Frankly, right-thinking Americans should hope the Clintons and their staff continue to go after media members, for with each shot across the bow they appear to be digging their own grave. LOU DOBBS, HOST: More presidential candidates are responding, beginning to respond to voter frustration over the issue of illegal immigration. They're presenting their own plans to fix our broken borders but not all of the presidential hopefuls are welcoming a debate about the tide of illegal aliens coming across our brooders. As Louise Schiavone reports now, Senator Hillary Clinton says my concerns on the issue of illegal immigration are just all that hot air as she put it. LOUISE SCHIAVONE, CNN CORRESPONDENT: Illegal immigration, despite all the talk and all the promises, it's the unfinished work of this congress and this president. PRES. GEORGE W. BUSH, UNITED STATES: It's in the nation's interest to get a comprehensive bill done. I believe we can get it done. SCHIAVONE: There never was a final bill or a signing leaving states and localities to do what Washington could not. MARK KRIKORIAN, CENTER FOR IMMIGRATION STUDIES: The activity to regain control of the immigration situation needs to come from federal and state and local levels. SCHIAVONE: Last year, nearly 300 measures became law in 46 states. Iowa voters prepare to the nation's first to judge the candidate, the issue is alive. UNIDENTIFIED MALE: People here illegally are going have to get in line with everybody else. UNIDENTIFIED MALE: We will say no to sanctuary cities. SCHIAVONE: It's ranked second as a concern among republicans only behind the economy in the latest CNN Opinion Research Corporation poll in Iowa. Although polls indicate it's less important to democrats, candidates have had plenty to say about it. SEN. BARACK OBAMA (D), PRESIDENTIAL CANDIDATE: We're not going be able to solve it if we're just shouting about it like Lou Dobbs and folks on television. 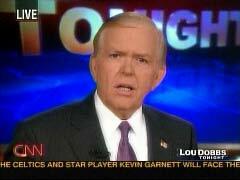 SCHIAVONE: This week, Senator Hillary Clinton leveled this apparent swipe at CNN's Lou Dobbs. SEN. HILLARY CLINTON, PRESIDENTIAL CANDIDATE: There are even some commentators who are doing well for themselves by making this a hot issue but ask yourself, does all that hot air solve anything? SCHIAVONE: That so called hot air did generate enough heat to help crush what both sides considered to be a flawed immigration bill not just last year but two years in a row. It helped derail a highly controversial effort in New York to give driver's licenses to illegals. (END VIDEOTAPE) SCHIAVONE: As you know well, voters is this year are looking for leaders not unlike the commentators that have shaken off Washington's paralysis. Voters know the problems borne of illegal immigration. Lou? DOBBS: It's fascinating to see Senator Hillary Clinton and Senator Barack Obama otherwise intelligent and generally respectful people decide to take me on this issue. The motivation I can't imagine because both people in point of fact have modified their views considerably over time. SCHIAVONE: They evidently believe according to the polls that the issue of illegal immigration really doesn't matter to the democratic base. As you say, it's an interesting assumption that people in general don't care about the economic costs, the crowded classrooms and hospital rooms. DOBBS: I think that what both candidates will discover on this issue is that the left wing of the liberals in the Democratic Party in the primary process support illegal immigration just as the right wing of the conservative element of the Republican Party supports illegal immigration for entirely different reasons. By the way, the candidates that pander to both extremes, are, as far as I am concerned, abject fools. They will pay a price for it in the general election when they have to answer to the great center of the country. Louise, thank you very much; Louise Schiavone reporting from Washington.